At Walters Brothers Harley-Davidson®, our customers come first. "Building lasting relationships with our partners and employees while serving Motorcycling Community. Our core values shall be based on Honesty and Integrity and Service to the Community." 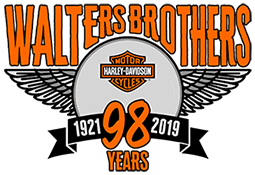 Walters Brothers Harley-Davidson® is located in Peoria, Illinois, and is a premium Harley-Davidson® motorcycle dealership serving Central Illinois' Motorcycle Landscape for more than 98 Years. Our State of the art Service Department is second to none, proudly serving the areas of Washington, Morton, Pekin, East Peoria, and Chillicothe, Illinois. Walters Brothers Harley-Davidson® is your one stop for all things Harley-Davidson®. With Central Illinois' largest selection of both new and pre-owned Harley-Davidson® Motorcycles to Customize or Own, including Street Glide®, Trike, Road King®, Road Glide®, Sportster®, Electra Glide®, Dyna®, Ultra, Softail, Street, CVO®. As well as a full MotorClothes® department, parts & accessories and service department. Stop by and see us today!